Bindings and Pipings and Facings, Oh My! 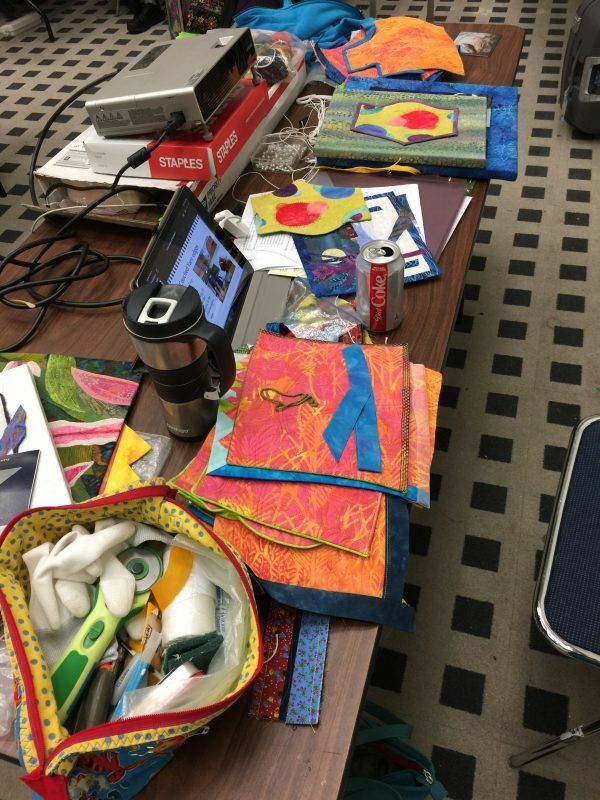 class in Houston 2018: Truth in teaching: this is usually what my teacher’s table looks like: a hot mess! I LOVE teaching this class! I LOVE that EVERYONE gets how to achieve a perfect mitered corner no matter what width your binding! 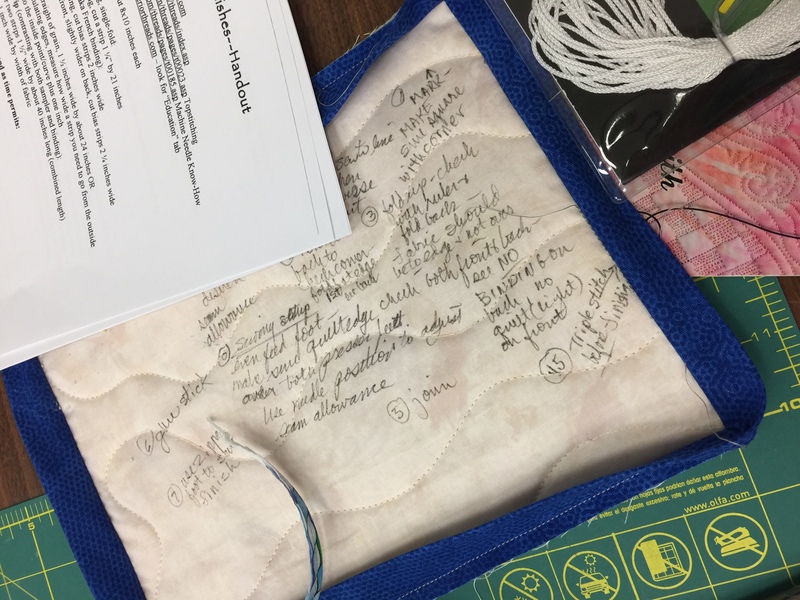 I LOVE showing students how to use Susan K. Cleveland’s Piping Hot Binding tool–students come into class thinking “I’ll try it but don’t think I’ll ever use it” and leave with the tool in hand planning how they CAN use it because it rocks! Then I teach my perfect facings for art quilts which by the way is also how you can do perfect prairie point “bindings” etc. 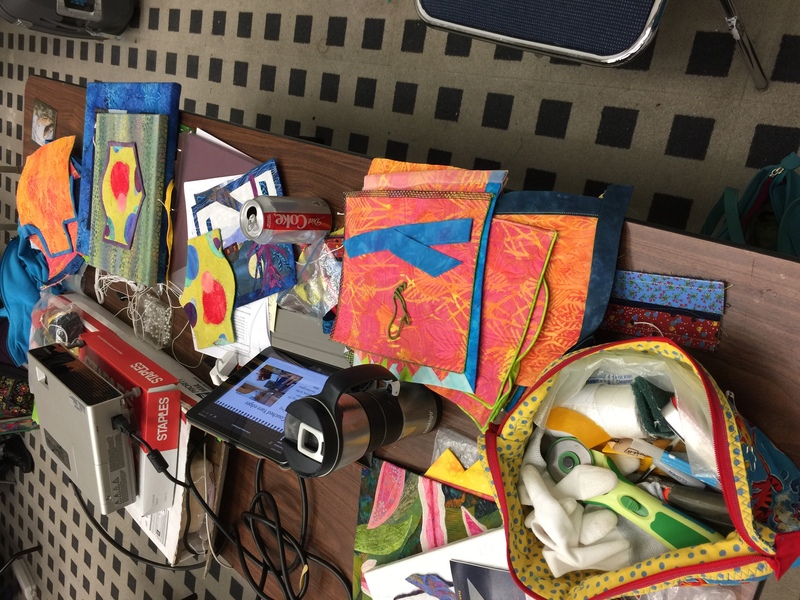 I LOVE that this class has something for everyone: traditional, modern, art, contemporary, whatever you do, it works. 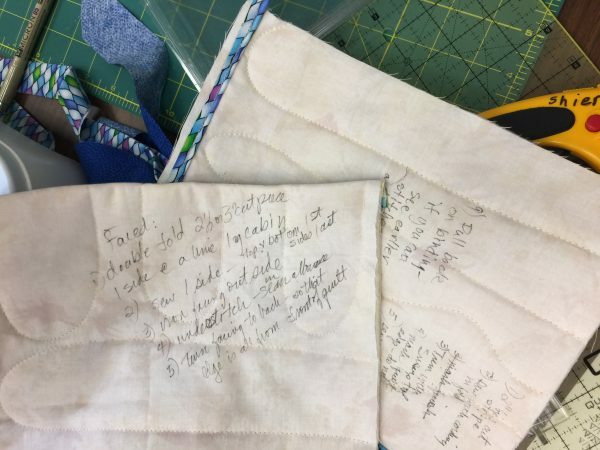 I also LOVED that this class more than any I have ever taught immediately embraced the idea of taking notes ON their class samples: that way the notes don’t get lost, what you need to remember about how YOU sew and what to do to improve is right there on the sample. YES! They got it! Put the notes ON the sample to remember how to get is JUST right! 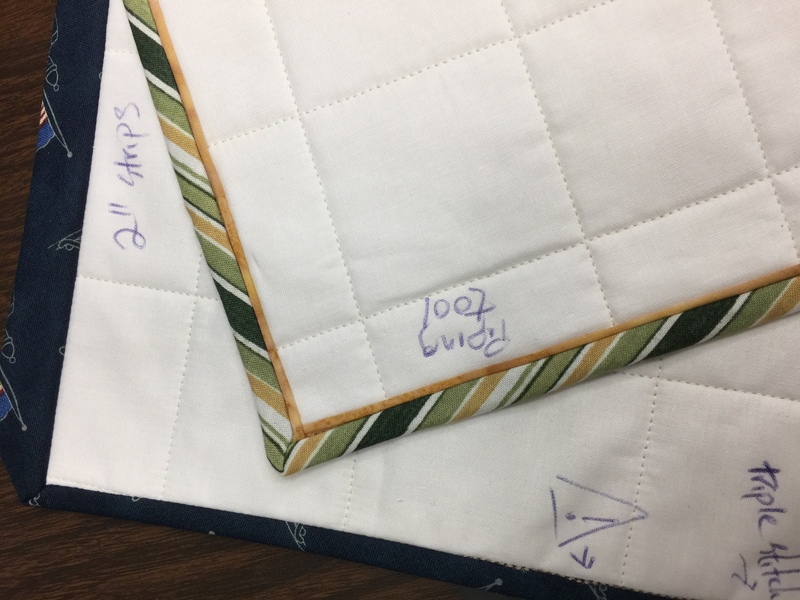 One older quilter in the class was BEAMING when she left–she was so delighted as she had never done a corner, let alone a piped corner, this good. 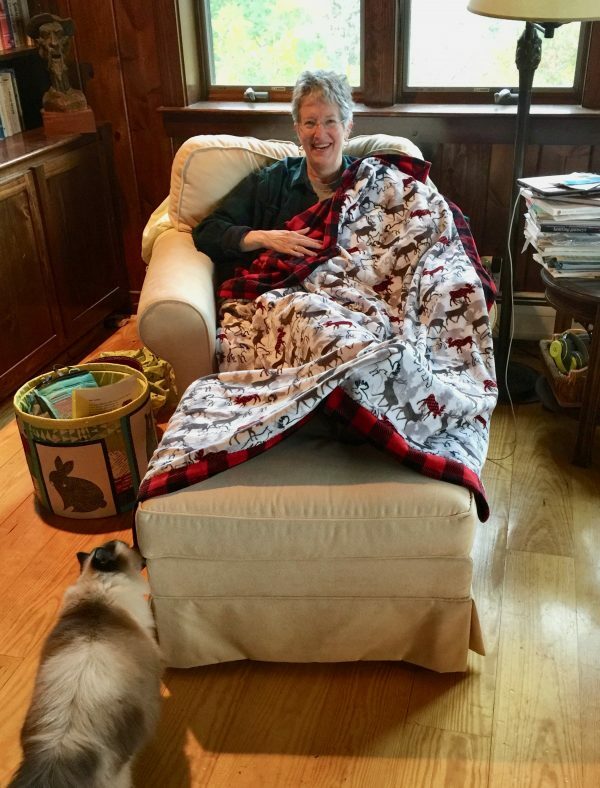 I think I will remember her smile forever–THIS is why I teach this class! Doesn’t the pink bandana fabric look great as piping? Midday/right after lunch we get to the piping (do the precise and time-consuming stuff first). LOVE Susan K. Cleveland’s Piping Hot Bindings tool. Available here. 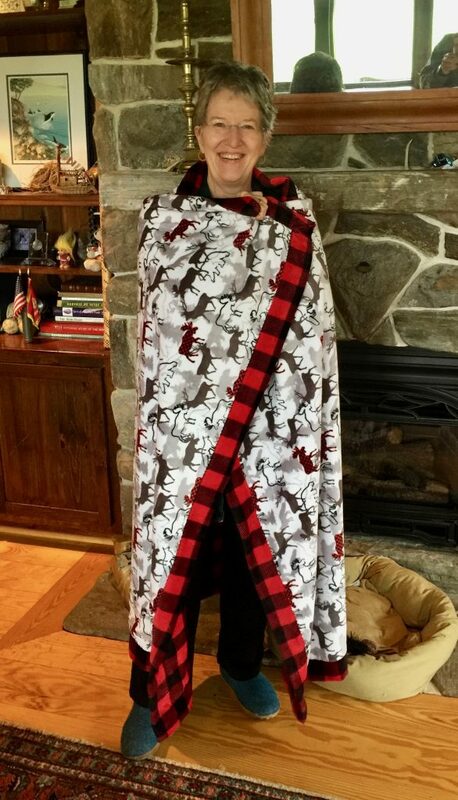 It may be available at larger online sites, but I like buying things direct from the creator–Susan’s website is Pieces be With You (in the link). I wrote my own instructions for the class handouts (without looking at Susan’s), but her more in depth instructions are worth every penny! The absolute BEST PART of International Quilt Festival is FRIENDS! 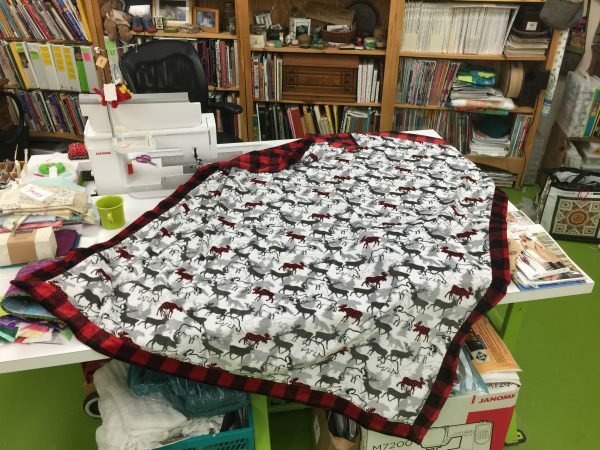 Over the summer I learned that Linda, a BFF from my life on San Juan Island, would have a quilt in a special exhibit and was coming to Festival. On Tuesday she showed up at my classroom door at lunch break with her friend from SJI. They decided on the spot to take my Bindings class on Friday, their last full day at Festival (pitter patter, tear in my eye)! It was like the intervening 14 years since I left the island evaporated. 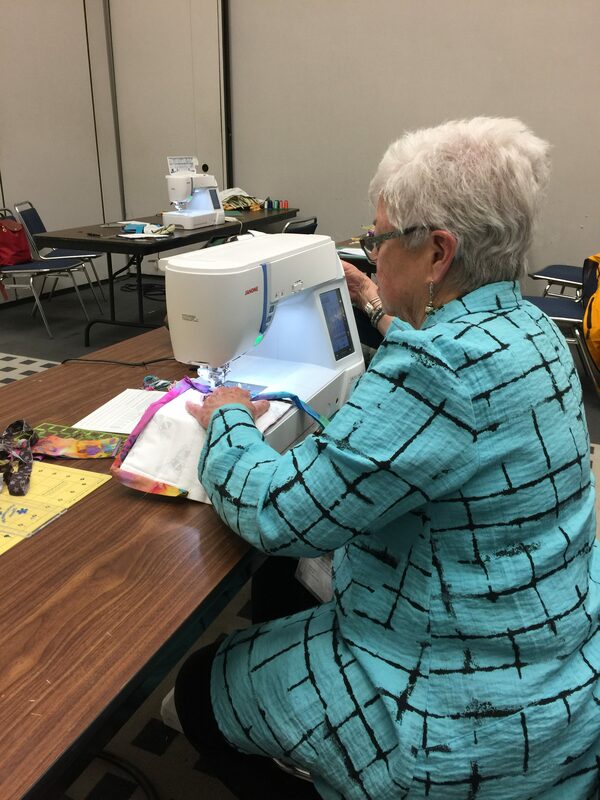 She and Barbara managed to get the stuff to make the quilt sandwiches (class prep) and amongst the three of us came up with the requisite thread, scissors, rotary cutters, etc. to use. Class….the lunchtime lull. 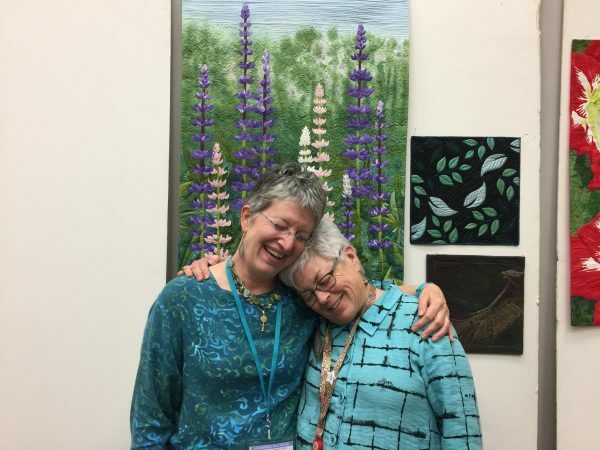 Thank you Kathy Spier for being my “Teacher’s Pet”—so much fun, met Suzy Webster when she took one of my classes a couple years ago. This year her mom took Bindings, and we all had lunch together! Like I said, the BEST PART of Festival is friends, old ones and making new ones! And miraculously, I remembered Linda and I needed to get a photo before she packed up for the day! 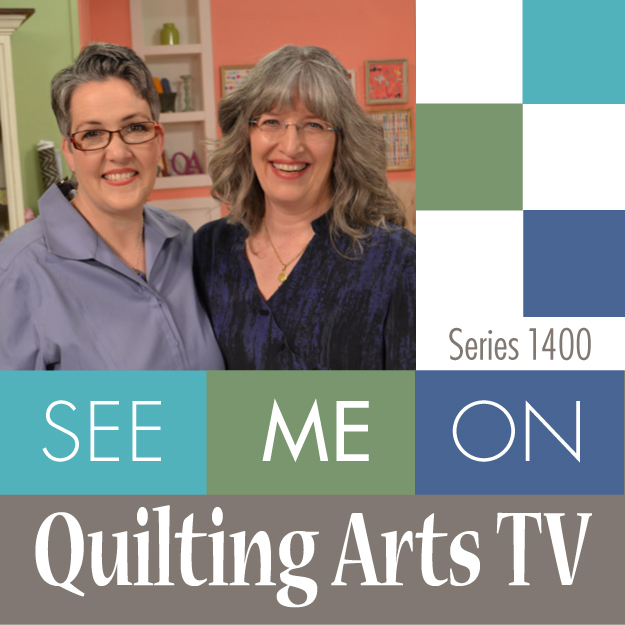 YES, I’ll teach you how to get perfect miters that match your seam measurement, no matter what it is, without having to measure! Today I’ll talk about my Fine Finishes workshop, #525 from 9-5 on Friday, November 9th, at International Quilt Festival Houston. Link to register is here and at the bottom of this post. 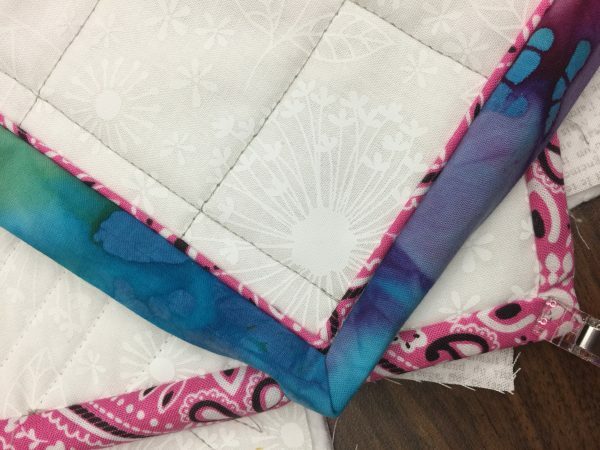 This class is all about what to do with the edges of your quilt…and not just straight edges: curves, inside points, sharp angles, facings not just bindings. Using techniques adapted from high end garment construction, you’ll achieve precise results, perfect corners, perfect miters, without measuring your seam allowance! You’ll learn about all of these and, depending on how fast you work, make at least four samples, maybe more. In Houston, it is class #525 on Friday. 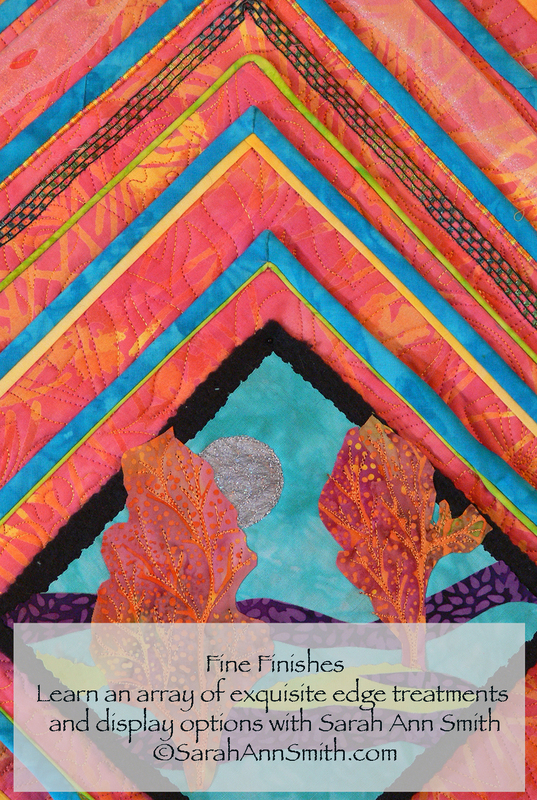 Fine Finishes has proved a perennial favorite –sign up soon! If the PERFECT bias binding hasn’t happened for you, or the PERFECT facing for an art quilt, one that doesn’t roll and bulge, you need this class. Have you ever considered piping? Time consuming, but OH MY what a wonder! So worth it … try these and more as time permits. Last but not least–and it usually fills up fast–is the Machine Quilting Forum on Thursday morning. Think of it as not-so-speedy dating for machine quilters. We meet in one of the large “ballrooms” at the convention center. 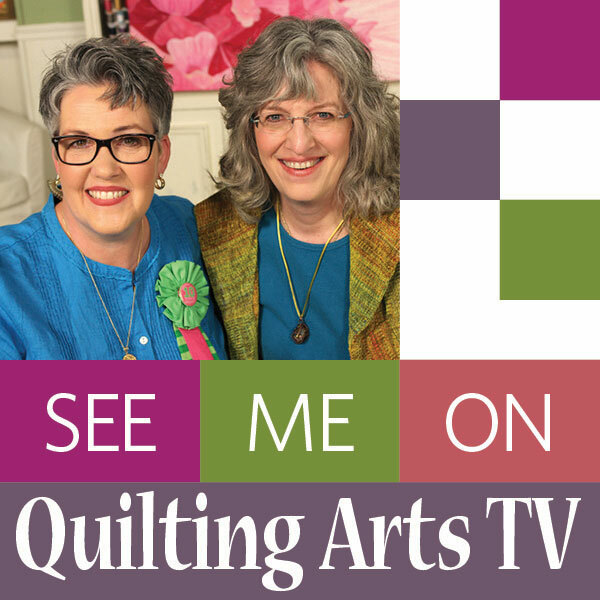 The first hour is an introduction to the presenters (I think there are six of us, or maybe seven, this year): each teacher gets a few minutes to share about 7 slides representing who they are as quilters. Then the participants break up into six (or seven) groups. Each group goes to a certain teacher, then after 20 minutes (15 presentation, 5 Q&A) a bell rings and the participants move to the next teacher. 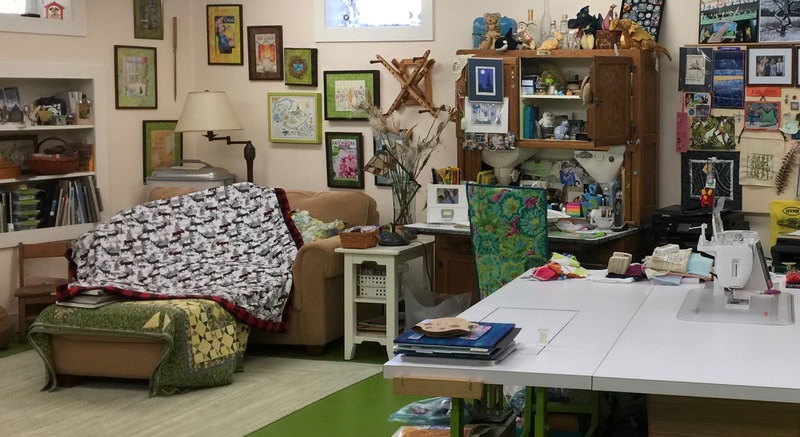 This is a fabulous way to learn a lot in a short time, get a great idea of a teacher’s style teaching, see if you want to take a class with them or have them come teach for your guild. 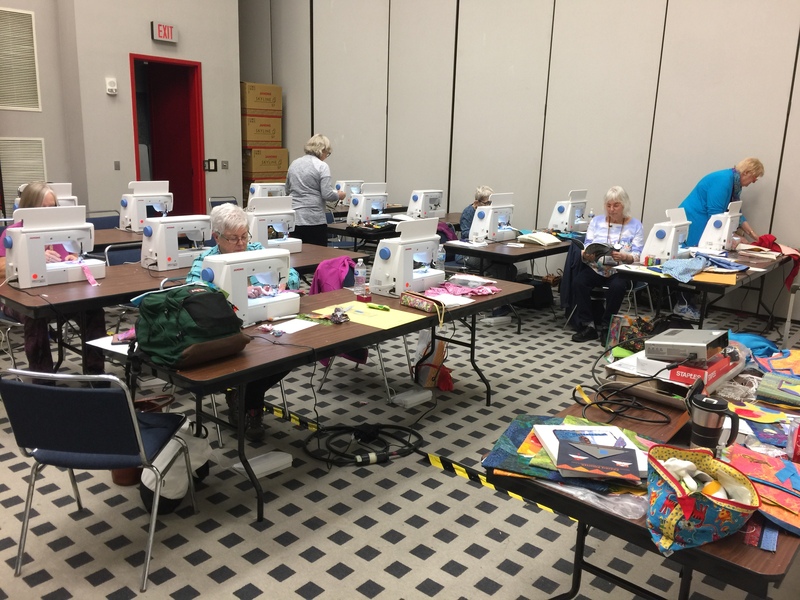 Registration is OPEN for classes for International Quilt Festival Houston 2018, including my four classes. 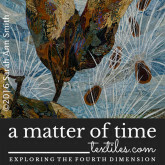 For more info on the other workshops, my first class, Birch Pond Season, is covered here. Collage the Garden, one of my newest classes and proving to be one of the most popular, is covered here. Last December at our local Coastal Quilters Christmas/Holiday meeting, we had a little game where you each bring a giftie, and end up with a different giftie. 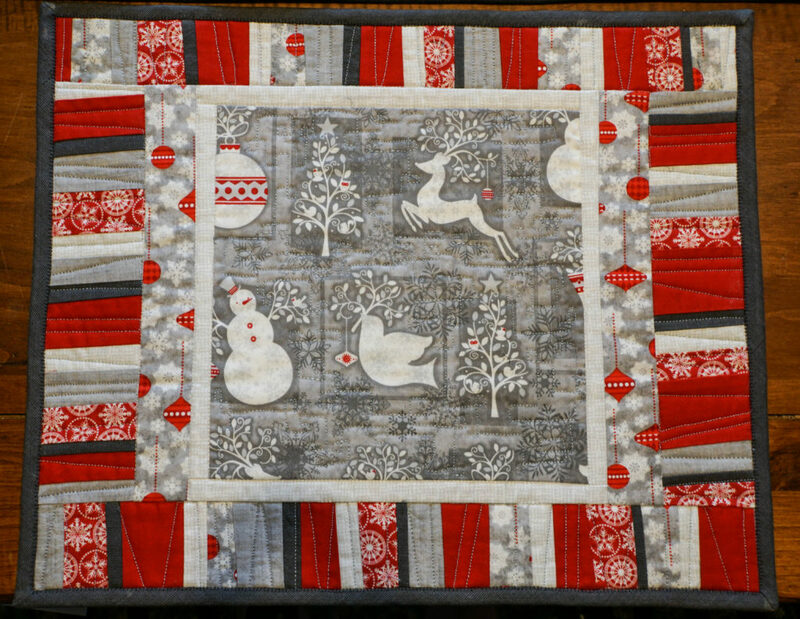 I ended up with a lovely set of fat quarters in very “Quilt Modern” colors: the red, white and gray winter themed ones. 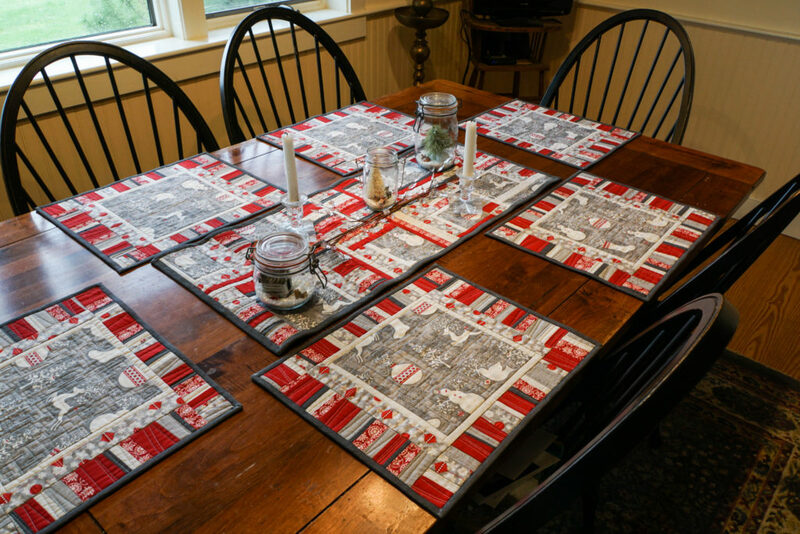 I decided to add some new winter placemats and table runner made from the theme fabric using improvisational piecing. 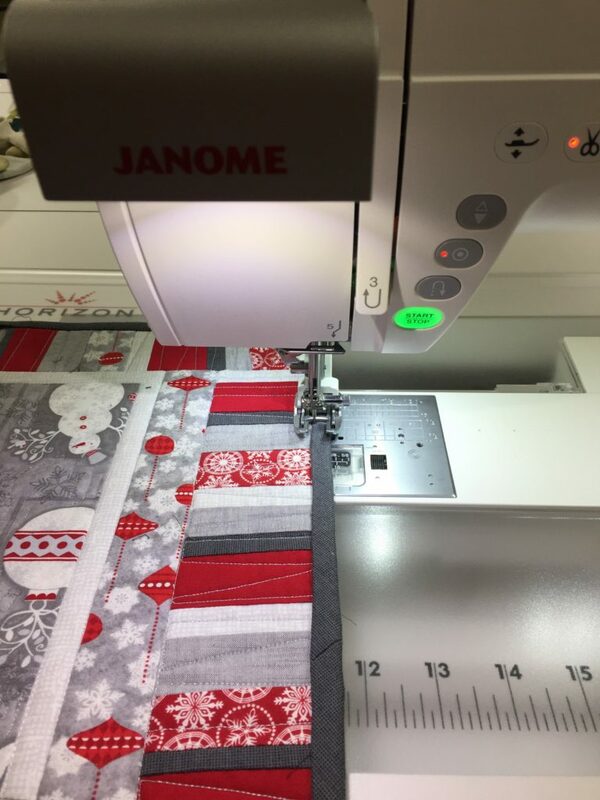 You can find the pattern at Janome America’s blog, here. 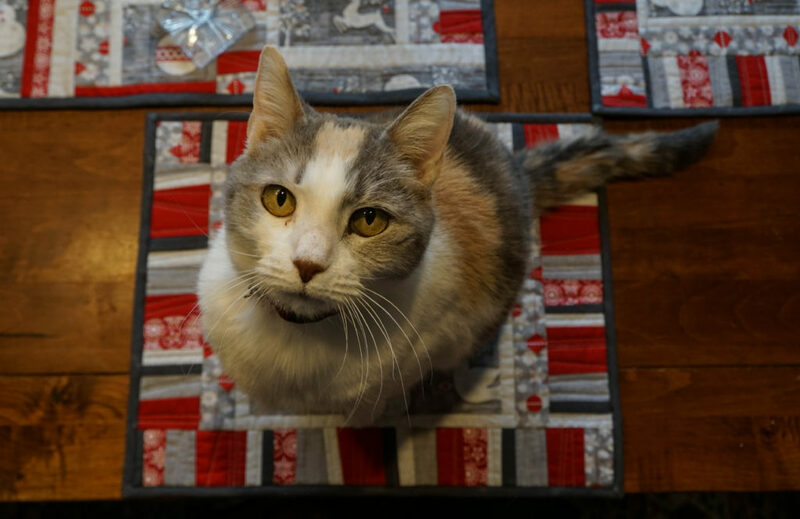 Modern Winter placemats and table runner. I added the solid red and dark gray fabrics. I will advise you: MEASURE YOUR TABLE FIRST. 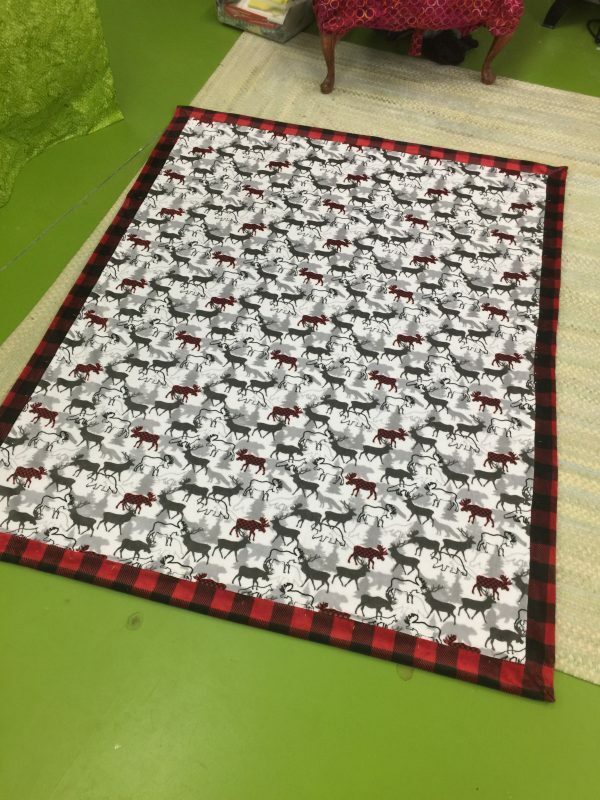 I made the placemats first, rather oversized. I had two of them bound. Then I discovered they were too big, had to pick off the binding, cut them down (the instructions on the Janome site are for my final size), and re-do. Erk. 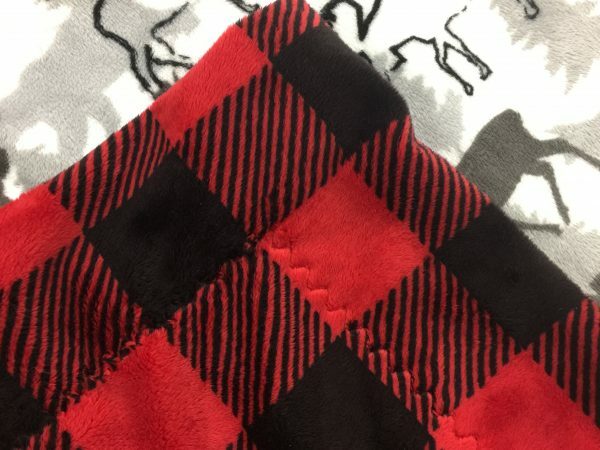 Depending on the fabric you select as a feature fabric for the centers, you can adjust the size of the inner borders (or omit them entirely). I had just a half yard of the feature print, so I needed to use smaller cuts and build them out. If you buy a little more, then you can omit the inner border and strips. 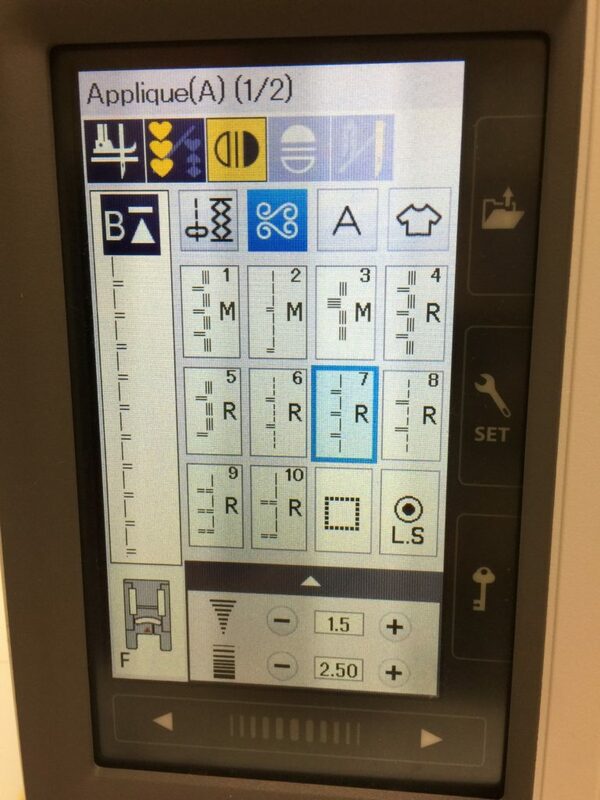 My favorite way to do bindings is by machine. My secret: glue stick! 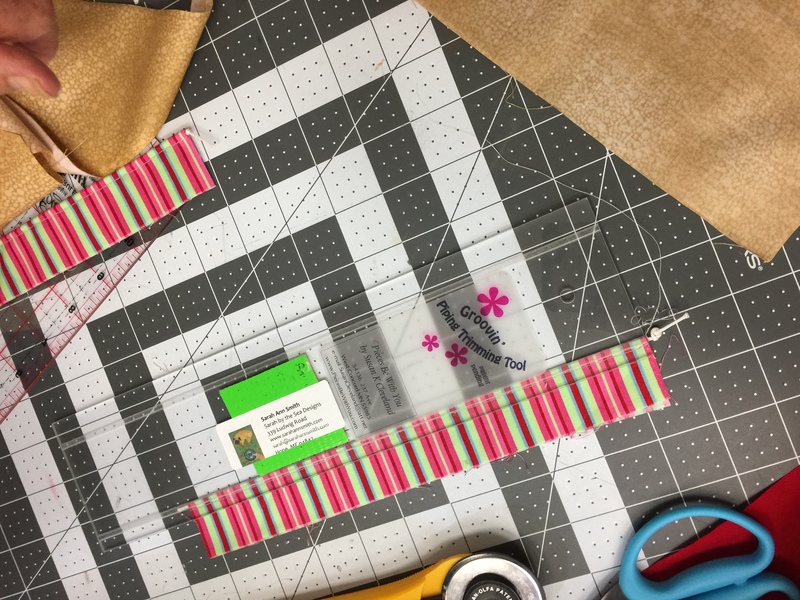 I only use the glue stick on things that will be washed (probably often), so I wouldn’t do this on a high-end art quilt, but for a baby or bed quilt or table linens? You betcha! Stitching down the bindings on the Janome 9400. Love that pull-out light! I sew the binding to the back, wrap it to the front, then at the ironing board use glue stick on the seam allowance. 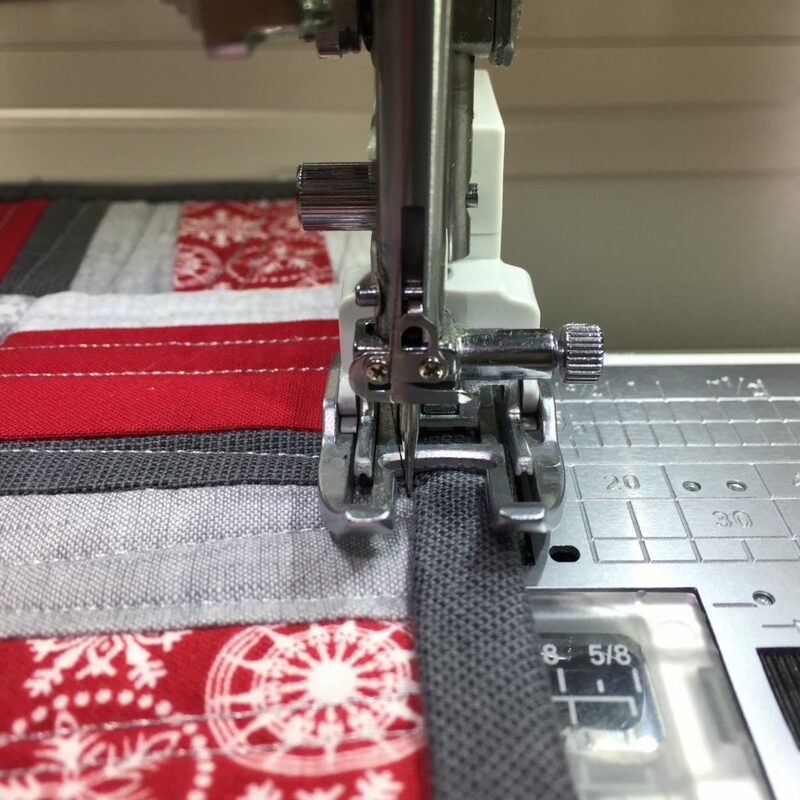 I press the binding down and it stays put–no pins! no bumps! no wiggling out of place! I used a blanket stitch, with the straight part in the “ditch” (just to the left of the dark gray binding), and the “zig” going onto the binding. I used this stitch to finish the bindings, and used the mirror image button (above in yellow) so that the swing of the stitch goes to the right of the straight line (see the stitch as displayed at the left of the screen). A closer view. 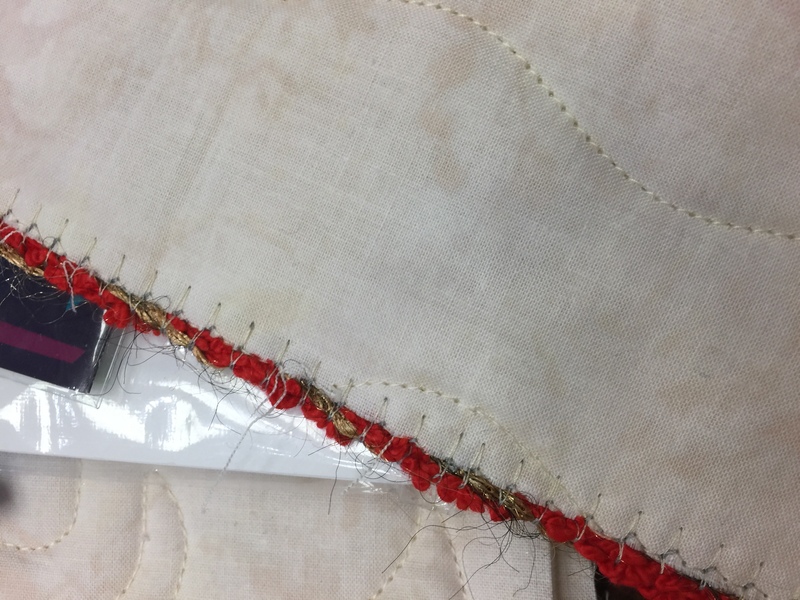 The needle just barely misses the binding when going straight, then swings over onto the binding to hold it in place. Back view of my quilting. 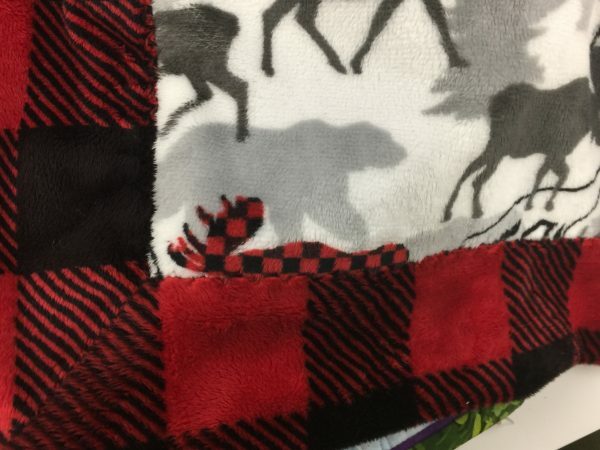 I used a FMQ ruler (thicker than a cutting ruler) with the QO foot (this is not necessarily recommended, you really should use a proper “Ruler Foot” but I was extra careful) to do the straight line quilting across the strip sets, then used a squared off loop in the background of the feature fabric bits. It must be good: it has passed the cat-sitting-on-it seal of approval! 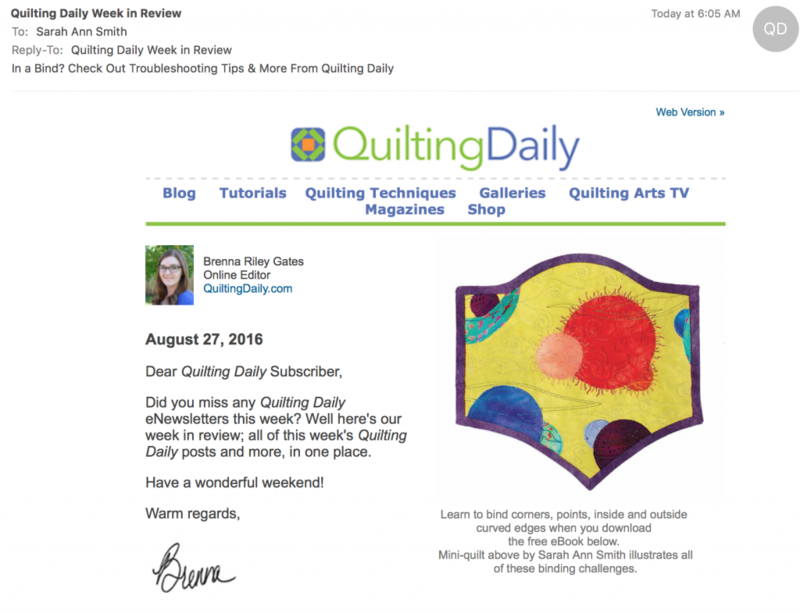 Well that’s a nice way to start the day: checking out the Quilting Daily (Quilting Arts/Interweave) email, and there is MY little quilt and a link to their free e-book featuring my article and those of several other quilters! From this morning’s email: my little quilt shows all sorts of binding challenges: regular corners, sharp corners, inside and outside curves, inside corner (on the top edge). So here’s a question for all of you: I have wanted for YEARS to write a book called Fine Finishes with my way to do bindings, edge finishes (including facings and all sorts of funky things), and how to display quilts (hanging sleeves, alternative ways to hang and display). Is anyone interested? I may or may not go the traditional submit-to-publisher route, or I might self-publish, even though I am awful about promoting stuff and selling it….. So tell me: should I take the time to write this book? I’ve got most of the samples made since I teach this as a class, would include work by others that I find inspiring in ways to display, and so on……. And don’t forget to click on the link and get your free e-book!